Shop or mobile welding in Toronto Ontario, ship outdrive, Mercury, Evinrude/Johnson outboard leg and OMC lower unit to be tig welded. We have some stock of steel, aluminum, stainless, specialty steel sheet, plate steel, threaded rod and bolts. Nation course / fine thread taps or die,s and pipe thread dies. For welding inquiries, contact Nick Shaganenko. 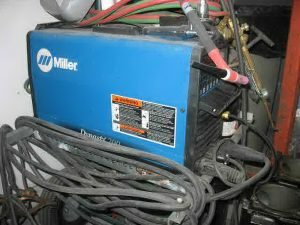 Miller welder (dynasty series 700 machine) used to tig weld aluminum) outdrives. Tips for tig Welding aluminum outdrive, outboard leg/head or stern drive gear-case. 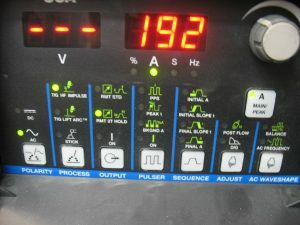 V310 T technologically advanced AC/DC tig welder used for shop / mobile welding aluminum or stainless steel: railings and stern drive lower units.